We’d love your help. Let us know what’s wrong with this preview of Why Me? by Sienna Grant. Everyone has an aim when they go to high school: make friends, pass exams, and leave. The hard truth is—it’s not that simple. High school experience depends on which group you fall into. I never thought for a minute I’d be branded. I wasn’t a Brainiac, but I got by. I wasn’t one of those gorgeous girls. I was me. I did my work, had a good circle of friends, and I wasn’t mean to anyone. But that wasn’t enough for them. To ask other readers questions about Why Me?, please sign up. Be the first to ask a question about Why Me? I should preface this review by saying that YA/Teen books are usually not my thing at all, however I've loved both other books by this author, so couldn't say no when I was offered the chance to review her new novella, despite it being a genre I tend to not read. This story centers around Mikayla, an average teen, neither unpopular, nor popular. She's simply a teenage girl who enjoys doing what most teens do, and she has a happy and wholesome life... until a new girl joins her school, who decides Mikayla would be the perfect target for her to pick on. Bullying is an awful experience for anyone to have encounter, no matter what age. This story truly touched me, and took me back to being a teenager. Mikayla was a sweet and likable character to read about. The way the story is written made Mikayla's hurt and pain feel so very real, I wanted to reach into the pages of the book and give her a hug. I experienced a mini roller coaster of emotions throughout this book, and shed a couple of tears by the end. As I've come to expect from Sienna Grant, Why Me? is a highly emotional story, but I was left with a smile and a feeling of hope. Bullying is an age-old issue that no matter where you are in life, you will always have someone bullying you or you will be the bully. Either that or you will know someone being bullied. For me, I have been a victim of bullying at multiple times in my life, and you do wonder how to get through it as it is difficult and often you wonder what have I done to deserve being treated like this or as the title of Sienna Grant's book reads - Why Me? Why Me? Tells the story of Mikayla Hobson and her bullying experience where she tried to be nice to a new girl and how it terribly backfired and the new girl started bullying her. Lucky for Mikayla in one aspect was that she had friends and family to support her. As sometimes and more often than not the person being bullied doesn't have the support, and this makes the person being bullied feel worst, and often they will resort to sad tactics and scenarios to escape from bullying and having to put up with this situation day in and day out. Why Me? By Sienna Grant was a quick read and gives readers a YA insight into the world of a bullying victim. If you know someone who is being bullied then readers, do the right thing and stand up for them and say NO TO BULLYING. Something that I'm 2017 is bigger than ever. Bullying it's a form of torture that needs to be more under control. With more and more people on social media you can't even get away from it at home. But with the right people & speaking up fighting back doesn't mean fighting words can do enough to empower a person, and that's how it worked for Mik. This story is just a blip of reality. So let’s start off by saying that this is a YA/ Teen book, not my norm, but the the subject matter was too important NOT to read it! Sienna tackles the all too popular topic of bullying. Now you would thing that with all the coverage and attention this topic has been given, that it would be a thing of the past. But sadly, it is still rampant and continues to spread like wildfire; especially cyber bullying and keyboard warriors who figure they a right to judge or hurt someone’s feelings, all under So let’s start off by saying that this is a YA/ Teen book, not my norm, but the the subject matter was too important NOT to read it! Sienna tackles the all too popular topic of bullying. Now you would thing that with all the coverage and attention this topic has been given, that it would be a thing of the past. But sadly, it is still rampant and continues to spread like wildfire; especially cyber bullying and keyboard warriors who figure they a right to judge or hurt someone’s feelings, all under the guise of anonymity. Why Me? take the reader on a journey with Mik or Mikayla and the progression of her experience with her bully. At first it wasn’t anything but a few dirty looks and name calling, and over the course of a few weeks it escalates and becomes much more. It begins to affect Mikayla’s daily life, from her grades, to her relationship with others. Mikayla struggles with just exactly how to handle the situation, as her decisions hold repercussions and consequences either way she decides to go. Eventually when it becomes too much to bare, she finally takes a stand and deals with her situation. I’m not going to sit here and lie to you, I have no idea what it is like to be bullied; not bragging about this, it’s just that I was fortunate enough not to be anyone’s target or punching bag. But Sienna does a fantastic job making you feel exactly what Mikayla goes through, from her “I’m not so sure that’s what she’s doing” all the way to the “I’ve had enough of her crap!” Moment. It feels like an accurate depiction of the situation and I empathized with Mikayla in a huge way. I wanted to go in there and become all Momma Bear with her bully! I also loved the way this issue is resolved, and that Mikayla is the one stepping up and taking her power back. It's a horrible ordeal that many children face today. As the mother of a young daughter who gets bullied I know the impact it has created in her life. I see her struggle, yet say she doesn't care, passes it off. In Why Me we met Makayla, who struggles with speaking out against the bullying she's receiving. Afraid it'll make it worse. She has fabulous friends who stick by her, and a great family at home. Although Makayla's story ends well, we know that in today's society some don't! It needs to be stressed to children at a young age that bullying is wrong, and will not be tolerated! Why Me..........what can I say about this book. Sienna Grant is a recently new author to me & Why Me is very different to anything I have read. Without giving too much away, the author has written this incredible story of a huge social problem that so many of our kids & even adults deal with on a daily bases. Bullying is a huge part of our society & I think everyone should pick up this book & read it. Support this incredible author & book. Congratulations Sienna on an amazing &am Why Me..........what can I say about this book. Another great book from an amazing Author. 'Why Me?' isn't Sienna Grant's normal romance style but I have loved all her books so I couldn't skip this one and I am so glad I didn't. Although a different genre the writing style continues to be engaging, characters adorable and I couldn't put it down. This is the Story of Mikayla, she's a normal teenager, doing what teenagers do, before the all too common trouble with another gorl at school starts. The story details how she does and doesn't cope wit Another great book from an amazing Author. 'Why Me?' isn't Sienna Grant's normal romance style but I have loved all her books so I couldn't skip this one and I am so glad I didn't. Although a different genre the writing style continues to be engaging, characters adorable and I couldn't put it down. This is the Story of Mikayla, she's a normal teenager, doing what teenagers do, before the all too common trouble with another gorl at school starts. The story details how she does and doesn't cope with what is happening around her, how it effects her and the support network she has. Many of us would have memories of bad experiences as teenagers and this book made me reflect on how bad those times were but also how I could of handled things better if I had only known how. The story really stirs your emotions, I found I was a sobbing mess several times in through the book. I think all young teenagers should read 'Why Me?' get a copy for yours. I was given an arc of Sienna Grant newest release for an honest review. I must confess YA is not a genre I would immediately jump to read however I was interested to read for two reasons. Firstly it was written by Sienna Grant and that is an automatic one click for me and secondly the topic made me want to see where she took her story. I so pleased to say I enjoyed every word of it. The story was told in such a way that whilst discussing the difficulties around being bullied it didn't loose sigh I was given an arc of Sienna Grant newest release for an honest review. I must confess YA is not a genre I would immediately jump to read however I was interested to read for two reasons. Firstly it was written by Sienna Grant and that is an automatic one click for me and secondly the topic made me want to see where she took her story. I so pleased to say I enjoyed every word of it. The story was told in such a way that whilst discussing the difficulties around being bullied it didn't loose sight of the fact that there are nearly always people around to help if you choose to let them. Sienna managed to get across the highs and the lows of a YA being bullied whilst still showing that there is light at the end of the tunnel. I received this book as an ARC for an honest review. I must say, I normally don't read Young Adult, but I truly can't express how this book touched me. I urge parents to read and share this book with their teens. Bullying is one of the leading cause of suicide among teens. It's one of the biggest problems we have and if we don't say anything and keep quiet it's never going to stop. This book is about a girl dealing with bullying and the fear of not being believed. She learns that by standing up I received this book as an ARC for an honest review. I must say, I normally don't read Young Adult, but I truly can't express how this book touched me. I urge parents to read and share this book with their teens. Bullying is one of the leading cause of suicide among teens. It's one of the biggest problems we have and if we don't say anything and keep quiet it's never going to stop. This book is about a girl dealing with bullying and the fear of not being believed. She learns that by standing up for yourself you can take the power away. Not all have happy endings like this and it's sad to hear when someone has gone to soon, when we have the power to stop it. This is a short read with a massive impact. Bullying is awful, and this book hits the target. My son gets bullied all the time and it's so hard to see the struggle that he goes through on a daily basis and I love half term. Just like Makayla, he struggles with speaking out and keeping it locked up, if you speak out is it gonna make things worse? If you say nothing with they get bored and stop? Children are taking their lives over not feeling good enough and that's not acceptable, a friend of min This is a short read with a massive impact. Children are taking their lives over not feeling good enough and that's not acceptable, a friend of mine's daughter took her own life and there's not a day that goes by that she isn't missed by her family and friends. I'll start by saying that this book should be read by everyone no matter what age you are. Sienna has written such a brilliant story, she has tackled a very serious situation that unfortunately affects so many people no matter what age we are and she's done a magnificent job. This is a story about a young teen Mikayla who is your typical girl trying to go about her daily life, what we witness is so sad and unfortunately it happens everyday. Mik tries to be friendly to a new girl in school but what ends up happening is so gut wrenching, it effects her grades , everyday life and interactions with everyone. I'll admit I had tears throughout this book but Sienna masterfully brought this story to surface. Bullying comes in so many forms.... name calling , body shaming , fighting , and with today's technology people find it ok to hide behind social media. This needs to stop, lives have been ruined and lost. I cannot thank Sienna enough for putting herself out there and giving us this story to raise awareness. This well written, sensitive and thought provoking book addresses a monumental problem in our society of bullying with our kids. This book is intended for YA/Teens, but let me tell you it ought to be read by everyone, regardless of whether or not you have children. Sienna Grant is a new author to me and I hope to be reading more from her! omg this book hit me real close to home. i was bullied as a teenager to the point of suicide. people just dont understand what words can really do to a persons self esteem. its sad how some people feel better about themselves to be this way. its a heartbreaking story that you people will love. you will need some tissues. thank you so much for sharing this beautiful book! Рассказ без какой-либо смысловой нагрузки. Ни о чем. I love this book and the fact that's its written for teenagers on such a touchy subject that needs to approached with care. Sienna has done a fantastic job, its a heart breaking story which will touch anyone's heart. I wish I would have read a book like this when I was a young teen. What I liked about this story is that it puts you right away in Mikayla's young life. She has a happy home and few good close friends. You can tell she was taught to treat others as you would want to be treated. A lesson that we are all taught so young and yet there are so many out there that can not grasp this lesson. Mikayla is old enough where I think she understands that her family is great and that they have a lot going on, so she tries to handle things on her own, but now that I am older I wanted to yell at her to get help. No one is ever old enough to handle everything on their own. Bullying is unacceptable. She like many, I think kids or teens make excuses. That one insult was just that it's nothing more, but then it snowballs and they can't seem to find a way out of it. I was happy that Mikayla had friends, decent and true! I was happy she had Dean. Right ? He was dreamy ! But this isn't a love story, this is about a young girl who gets pushed around to the point of a nervous breakdown before reaching out and above. She becomes the hero of herself, by realizing relying on the good people in your life and speaking out, is the only way out of this potential tragedy. It teaches you that you have to speak up because you should never silence yourself. In silence comes doubt, makes you feel like nothing, and you are something. You are a someone, you are alive and with potential to do amazing things, a bully is a bully for no reason at all just to put someone else down to make themselves feel better. Don't question yourself. Don't question them, tell somebody! I honestly hope that many read this story. it's fast paced, it's a powerful message that reaching out for help doesn't make you weak, you are strong when you rise above and talk about bullying. I honestly think it's a good read for parents. Her parents noticed behavior, and asked questions. I think it's good for teachers to read, to help them open their doors to talk to students. Reviewing on behalf of Sarah & Amo's book corner. This is one of the most heart-wrenching books that I have ever read! It is fantastically written and as a reader, I felt every emotion that was portrayed. The story follows a young Mikayla, who, at one time, loved school and was doing brilliantly. However, things came to an abrupt change when the new girl, Analese decided that for some reason she hated Mikayla and wanted nothing more than to make her life hell. Mikayla went from being a fun-lo Reviewing on behalf of Sarah & Amo's book corner. The story follows a young Mikayla, who, at one time, loved school and was doing brilliantly. However, things came to an abrupt change when the new girl, Analese decided that for some reason she hated Mikayla and wanted nothing more than to make her life hell. Mikayla went from being a fun-loving normal teenager to being a shadow of her former self, always feeling down and depressed and frightened to go out in case she bumped into Analese. Gradually though, with the help and support of her family and friends, Mikayla was able to confront Analese and put an end to her bullying tactics once and for all. This story is very thought provoking and brought back painful memories for me as I too was bullied as a young girl. But the bully never wins in the end and every young person who reads this book should know that as a fact. Tell someone about it - always be ready to accept help. A bully will only pick on someone who they believe to be vulnerable in some way, as sometimes this makes a person easier to manipulate. I would recommend this book as being suitable for teenagers and young adults and I will certainly be encouraging my daughter to read it. It is written is such a clever way that it not only tells the heartbreaking story of what Mikayla has been through, but in it's own way it advises on how best to deal with bullies. reviewed on behalf of amo and Sarah's book corner. oh wow what can I say another cracking book by sienna about a subject that doesn't get talked about enough but happens all the time and that's bullying. story centres around mikayla who is being bullied at school and what she goes through at the hands of Analese is horrible. story's like this happen all the time in schools even in other places too but it's never talked about enough. I really felt for mikayla as I've been there and was bullied in sc reviewed on behalf of amo and Sarah's book corner. I really felt for mikayla as I've been there and was bullied in school so it brought back a lot of memories. the way sienna writes is amazing she really makes you feel what the characters go through and I can tell you you'll need tissues by the end of this book, also prepare to get angry too at the bully in this book I was shouting at my Kindle at one point cause it made me so angry. sienna has done it again amazing story beautifully written and about time bullying got put at the forefront of a novel cause it doesn't get talked about enough. This incredible story hits the mark for me in tackling one of the toughest issues surrounding young people....bullying. The author has done an amazing job at dealing with the victim and how with the support of her friends and family, she was one of the fortunate few to pull through this awful period in her life and come out the other side. The story followed a likeness of the recent "13 reasons" for me and reasonated so much office school This incredible story hits the mark for me in tackling one of the toughest issues surrounding young people....bullying. The author has done an amazing job at dealing with the victim and how with the support of her friends and family, she was one of the fortunate few to pull through this awful period in her life and come out the other side. The story followed a likeness of the recent "13 reasons" for me and reasonated so much office school days. For me, this should be recommended for all young people. Showing that with a little courage, even when you feel you have none, you'll be stronger than you ever imagined. This story was extremely close to home for me, this is a very well written story of bullying. This book looks at a topic that is never really talked about but is becoming a growing epidemic in schools today. If only more authors would take up this banner and let the kids out there know they're not alone. I can imagine that this story was as difficult to write as it was to read, but saying that you can't help but want to know what's going to happen, I loved this book from start to finish. Mikayla was one of the lucky ones whose situation got resolved. Bullies are everywhere, and they seem to be getting bigger in number. Yes, you needed to tell someone you trust about the situation, but it doesn't always work out as fast or as well as it did for Mikayla. Bullies are a real problem, especially in public school systems. Parents, please teacher your children to be kind, don't spread the hate. DIRTY KNEES REVIEWS: Why Me? by Sienna Grant 5 KNEES! Such a great read for those that are affected by bullies. Knowing how personal and raw this is for the author, I struggled to keep my temper in check while reading. I think this would be a fantastic tool to reach out to those affected and let them know you can always tell someone, you are never alone. I recieved an arc of Why Me for an honest review . This is my first book of Sienna's that I have read. When I heard about this book and read a small excerpt from it I was excited to read it. It is a short read but has a large message ....Stand up to bullies ..... don't let them win .... we all deserve to be happy. Bulling is something that is happening all over and with the accessibility of social media it is harder for people to escape it and kids are left feeling alone and helpless. This book I recieved an arc of Why Me for an honest review . This is my first book of Sienna's that I have read. When I heard about this book and read a small excerpt from it I was excited to read it. It is a short read but has a large message ....Stand up to bullies ..... don't let them win .... we all deserve to be happy. Bulling is something that is happening all over and with the accessibility of social media it is harder for people to escape it and kids are left feeling alone and helpless. This book shows that if we reach out, there is help and guidance out there whether it's a friend, a teacher, family member SPEAK OUT DON'T SUFFER ALONE!! I thought this young adult book was written well from the teenagers point of view. At the beginning she didn't even think she was being bullied and it was the support from her family and friends that help her to see that in fact she actually is. We follow her journey where she gains the strength to never give up. She speaks out and she takes back her life . I seriously have no words for this book, it is unfortunately all to relevant in today’s world and hit home with me as I was bullied throughout secondary school. Mikayla is a normal teenager trying to get through her exams, she has a great group of friends but the new girl in school takes a disliking to her for some unknown reason. What happens is all too real for a lot of people, whether it was at school or later in life. Bullying is not OK and hopefully this book gets through to some people who are suffering with it and they choose to speak out and get help. This is my first book and Why Me is different from the books she traditionally writes. This is a book about bullying and the impact it can have on not just the person being targeted but everyone around. I feel every parent and child should read this book and know that bullying is not their fault and they should never be afraid to tell an adult what's going on. 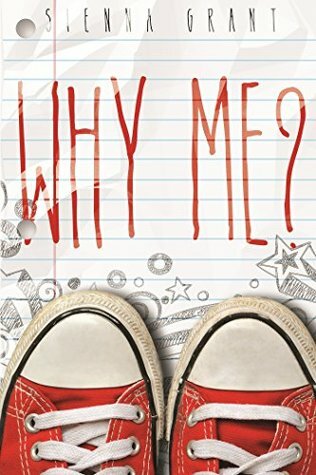 Sienna grant has really delivered with this short read, why me delivers a very important message About bullying which I can totally relate too! I 100% recommend everyone reading this YA book. This book is amazing. I love how in depth the story is on the concept of bullying. Sienna Grant's take on the subject is brilliant. I love that she wanted to give something to her daughter to read as well. My heart cried so much for the main character. Truly amazing.